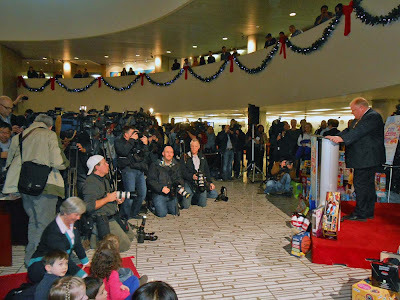 Just hours after being removed from the office of Mayor of #Toronto, Rob Ford meets a packed media for the launch of the city’s 2012 Toy Drive. 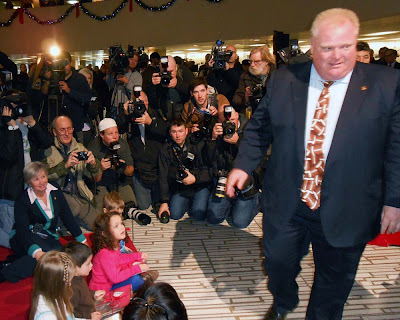 Ignoring hordes of journalists the embattled Mayor does not discuss the court case or the Monday, November 26, 2012 judgment as he made a speech and later handed out presents to children. 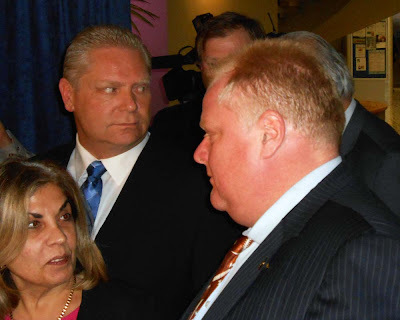 Rob Ford was found guilty of conflict of interest. Before the Toy Drive the Mayor indicated that he would be fighting the conflict of interest charge and will look for a stay to continue as Mayor during the legal fight. 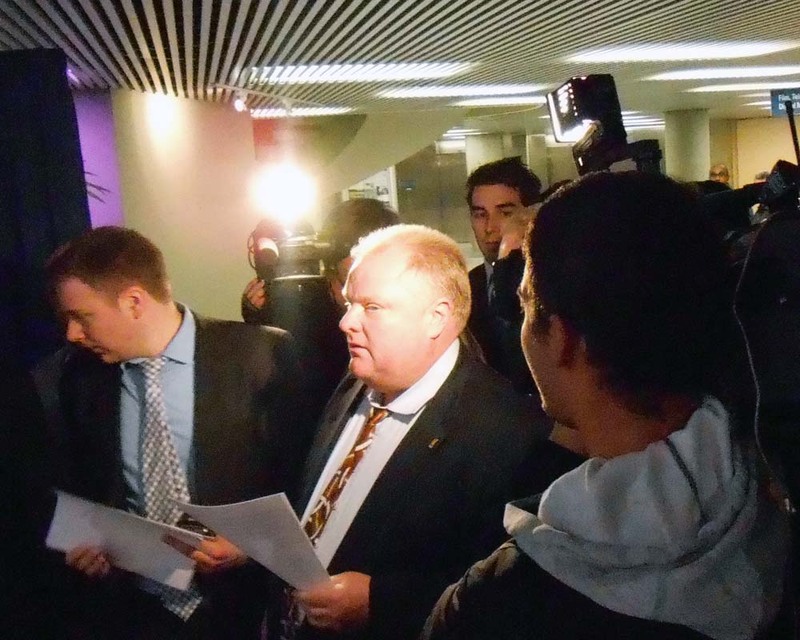 The extreme and madatory sledgehammer penalty requiring that members vacate their office slammed down on Rob Ford. While it might make many happy, is it really fair in this situation? “Mayor Rob Ford and City Manager Joe Pennachetti along with a number of children acting as "honorary elves" kicked off the 2012 Mayor's Toy Drive today. Together, they accepted the first donations to the campaign and began to fill the Toronto City Hall donation box. "This is a great start to the toy drive," said Mayor Ford. "In 2011, we collected more than 1,500 toys, gifts and gift cards. I am hopeful that we can exceed that number this year and make this a festive and memorable Christmas for everyone in Toronto." "City staff have a long history of giving back to the community," noted Pennachetti. "I know that as we did last year, staff will once again embrace this initiative with enthusiasm." • City Hall, 100 Queen St. W.
• Metro Hall, 55 John St.
• North York Civic Centre, 5100 Yonge St.
• East York Civic Centre, 850 Coxwell Ave.
• Scarborough Civic Centre, 150 Borough Dr.
• York Civic Centre, 2700 Eglinton Ave. W.
The toys, gifts and gift cards collected will be distributed through established toy drive programs run by Global Toronto/Toronto Fire Fighters' Toy Drive and the CP24 CHUM Christmas Wish. Donations will help provide a festive Christmas for Toronto children and families who might not otherwise have one. All toy and gift donations are appreciated. There is typically a shortage of gifts for infants and teenagers. Gift cards for grocery and department stores help to make the holidays enjoyable for families who need assistance.